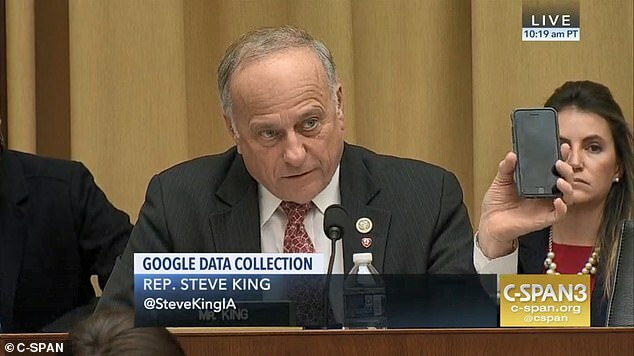 Google chief executive Sundar Pichai gently chided conservative Congressman Steve King on Tuesday, when the 69-year-old lawmaker complained about a notification his grand daughter got on her iPhone. 'Congressman, the iPhone is made by a different company,' Pichai responded. Apple makes the iPhone - Google provide the operating system for Android devices. King made his complaint during Pichai's appearance before the House Judiciary Committee, where lawmakers questioned the tech CEO on privacy issues, data collection, allegations of conservative bias and the company's plans to expand to China. He is one of several Republican lawmakers who have alleged Google is biased against conservatives in its search results. President Donald Trump has made a similar complaint. King was wrapping up a soliloquy of grievances against the tech company when he ended with a story about his granddaughter and waved around an older version of the iPhone as he spoke. 'I have a seven year old granddaughter, who picked up her phone before the election and she was playing a little game - the kind of game a kid would play - and up on there pops a picture of her grandfather. 'And I'm not going to say into the record what kind of language was used around that picture but I would ask you: How does that show up on a seven-year-old's iPhone who was playing a kid's game?,' he asked Pichai. 'Congressman, the iPhone is made by a different company,' Pichai responded. Apple makes the iPhone. 'It might have been an Android,' King shot back. Android is a Google product. 'There may have been an application which was being used that had a notification,' Pichai replied. He promised to have his team follow up with the congressman's staff to get more details. The exchange came near the end of Pichai's three and half testimony before lawmakers on the House Judiciary Committee. It was his first time testifying before Congress. The hearing was dominated by questions of data collection, privacy, and allegations of bias against the search giant. There was less talk about anti-trust issues and regulations with a few queries on Google's actions in the wake of the 2016 election after it was revealed Russian nationals used online platforms to influence the election. 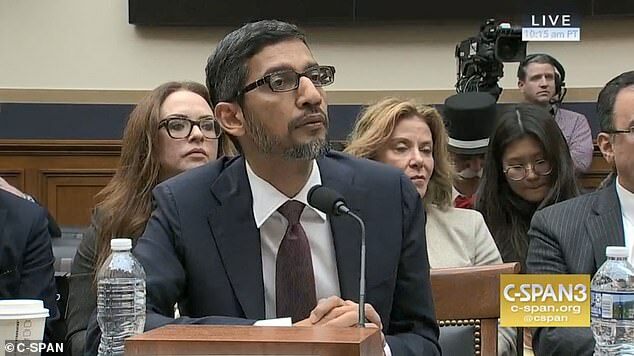 Pichai defended his company's search practices multiple times on Tuesday in the face of questions from lawmakers on allegations of bias against conservatives. The topic came up repeatedly in the three and half the tech executive sat before lawmakers on the House Judiciary Committee. 'Our algorithms have no notion of political sentiment,' Pichai said in defense of Google's search engine, which is the most used in the world. 'We approach our work without any political bias,' he insisted.